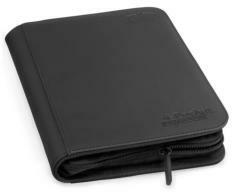 High quality Portfolio with flexible and durable cover, innovative XenoSkin surface and 20 integrated 4-pocket-pages for all standard- and Japanese-sized gaming cards. Zipper closure for extra security! Prevents your cards from falling out when carrying it around. Zipper closure for secure transportation and major protection! Innovative material with anti-slip texture.